I visited Lake Toba a few months ago. On the visit, I stayed in Carolina Cottage, a small cottage in Tuk Tuk. Located on the east side of Samosir Island, the cottage has beautiful view of the lake and surrounding hills. It has about 20 rooms and the one that I stayed was a small detached hut with an upsweeping roof ridges. My room was located on the rightmost of the cottage and had two beds with a modest bathroom. In the middle of the cottage, there is a restaurant serving Western and Indonesian food. One thing unique about the restaurant that I had not seen elsewhere is that you just order the food during your stay and they will only bill you when you check out — a convenient way for longer staying guests. To the left are rooms and a garden with long benches, a gazebo and a wooden jump board protruding to the lake. A few trees surround the gazebo with a small fish pond on the side. A totem pole around the height of an adult stands in front of the pond. The photo above was taken on the first day I arrived. It was a windy afternoon and the sun can hardly be seen. A boat had just arrived to alight guests before heading back to opposite shore. I stayed two nights in this cottage. On the first day, as I arrived late in the afternoon I swam and immersed myself around the lake until it was dark. Next morning, I rented a motorbike and toured around the northern coastline of Samosir Island which is about 50 kilometres long. I made a few stops along the way. First to the museum — it was noon when I reached there. The museum was open but I hardly saw other visitors. Ancient tools, weapons and boat used by the Batak in the past were displayed in one section of the museum. In another section, granaries, tombs and a dancing ground with a two meters high totem pole. After the museum, I rode to Pangururan and it took me 2 hours to reach. A few hot springs lined up along the route between the museum and the bridge just outside Samosir Island. I stopped at the narrow canal that separated the island from the mainland for a while before completing the tour and rode back to the cottage. 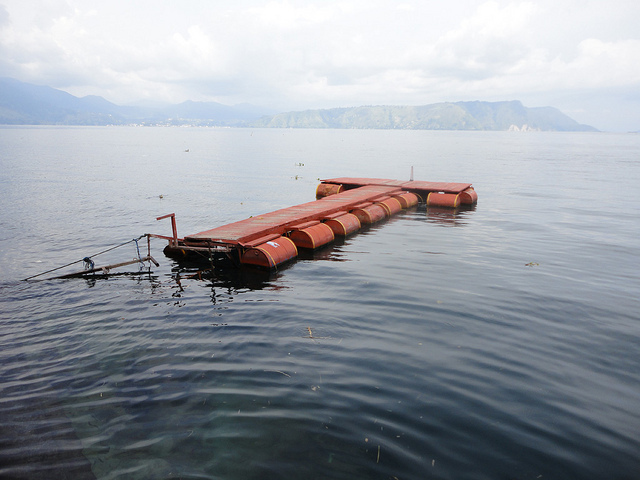 Here are some of my Lake Toba pictures on Flickr.